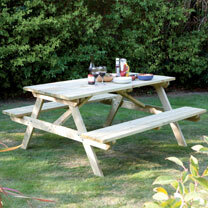 With sturdy construction, this easy to assembly picnic bench seats up to 4 people. The tabletop and bench seats are preassembled and pressure treated to protect against rot. Has a natural timber finish which can be painted or stained if desired.Height: 70cm, length: 120cm, depth: 150cm. Delivery: £5 delivery surcharge. Available to UK Mainland only.